Final report of the project "Models, Potentials and Long-Term Scenarios for Resource Efficiency "
The SimRess project tested the potential effects of future developments and strategies relevant to resource policy on important environmental and economic indicators. The study summarises the main project findings of the project "Models, Potentials and Long-Term Scenarios for Resource Efficiency". It is available for download. By means of a trend analysis, developments were first identified which could have a positive or negative influence on the use of natural resources in Germany and globally in the future. These developments were then embedded in different scenarios that served as a framework for the simulation of potential effects in the econometric model GINFORS3 and in the system dynamic model WORLD6 as well as in a soft link of both models. Human use of natural resources poses a great challenge to social-ecological and socio-technical systems alike: supply risks, pollutant and greenhouse gas emissions, waste generation on the one hand, but also issues of global justice and societal well-being on the other hand. In order to test potential impacts of developments and strategies relevant to resource policy, the SimRess project first identified trends that positively or negatively affect resource use in Germany and globally in the future. These trends were then incorporated into resource relevant scenarios (without as well as with assumptions of further resource and climate policy measures), which served as frames for simulating potential impacts via the econometric model GINFORS3 and the system dynamic model WORLD6 as well as through a soft-link of both models. The simulation results show on the one hand that continuing existing resource policy efforts on national and international level will remain an important contribution to increasing resource productivity and economic development. On the other hand, however, it was found that achieving targets for per-capita resource use, as called for by national and international sustainability scholars, needs a much greater level of ambition in national and international resource policy. This demands widening resource policy’s focus from increasing productivity in production structures to also tackling changes in consumption and investment patterns. Correspondingly, it seems important to expand the toolkit of resource policy instruments to much more integrate both economic and regulatory measures. Martin Hirschnitz-Garbers et. al. 2018: Potentiale und Kernergebnisse der Simulationen von Ressourcenschonung(spolitik). 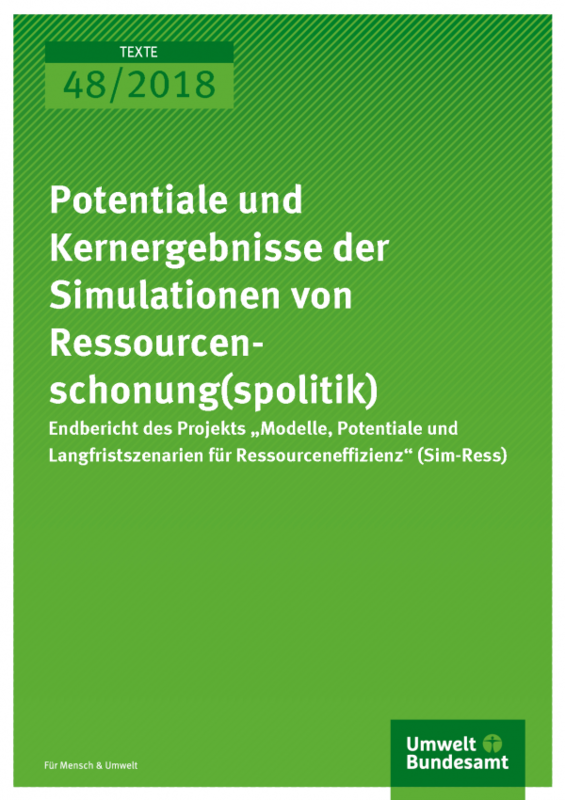 Endbericht des Projekts "Modelle, Potentiale und Langfristszenarien für Ressourceneffizienz" (Sim-Ress). UBA Texte 48/2018. Umweltbundesamt: Dessau-Roßlau. 3.1.2 Entwicklung und Einbettung der Referenzszenarien . 3.2.1 Modellierungsansatz von WORLD6 .